Runs with a nudge of the balance wheel. 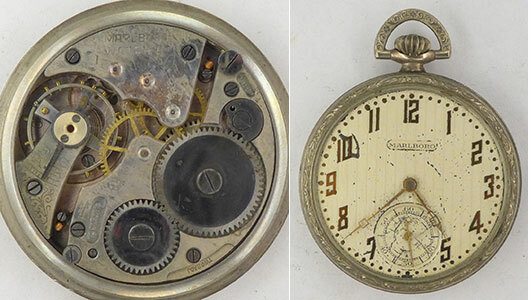 Beautiful little movement private labeled for T. & E. Dickinson & Co. of Buffalo, NY. Has the look of a Longines, but I'm not sure. 22.9mm diameter. Balance swings nicely, so will probably run with a proper stem to wind it. 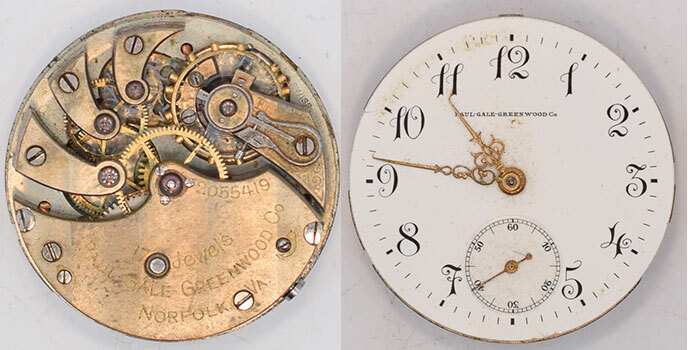 High quality Swiss 17 jewel movement private labeled for Paul-Gale-Greenwood Co of Norfolk, Virginia. 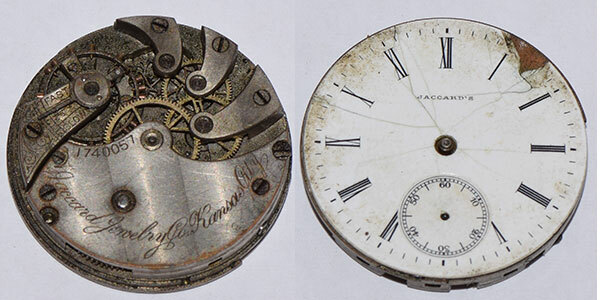 29.4mm diameter. Not running but balance seems OK. 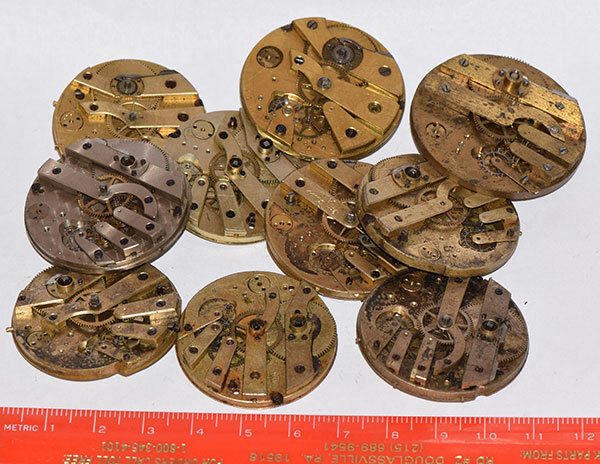 Rode Watch Company pocket watch movement. 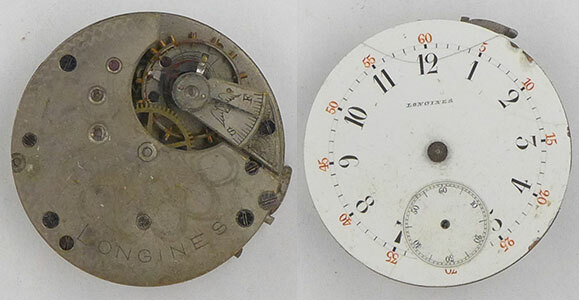 Has several names scratched into the dial. 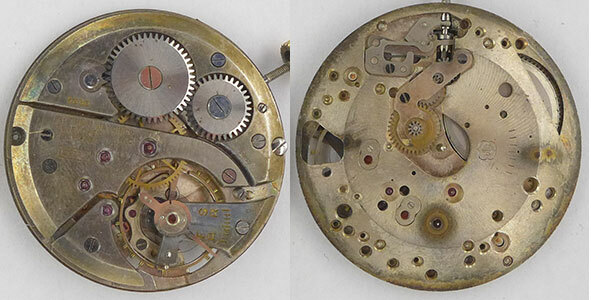 Un-named Swiss pocket watch movement. 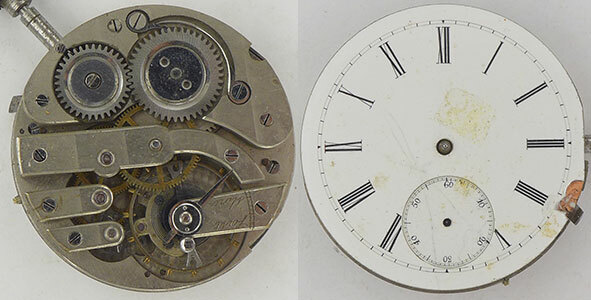 45.6mm diameter. 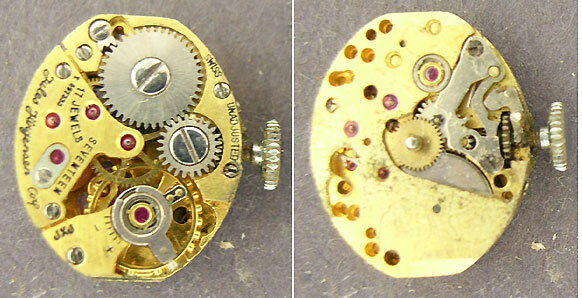 Longines pocket watch movement in a gold filled case. No hands or crystal. 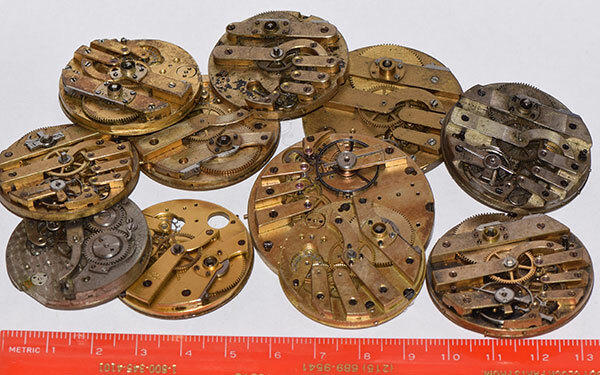 Longines thin model pocket watch movement. 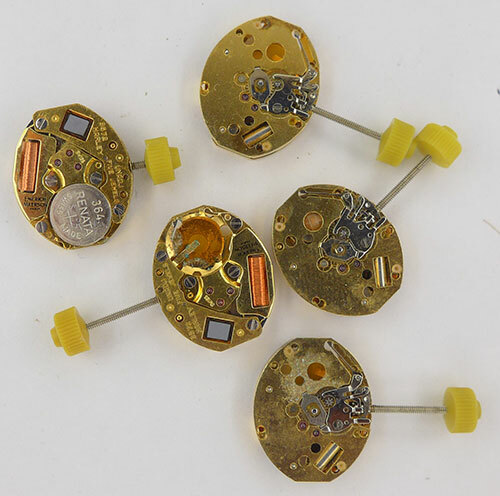 43.6mm diameter, 4.3mm thickness. 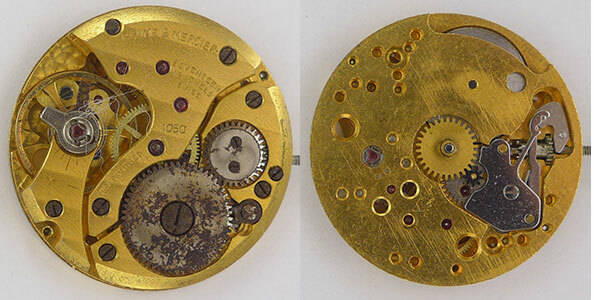 Swiss movement for the Hayden Wheeler Watch Company. 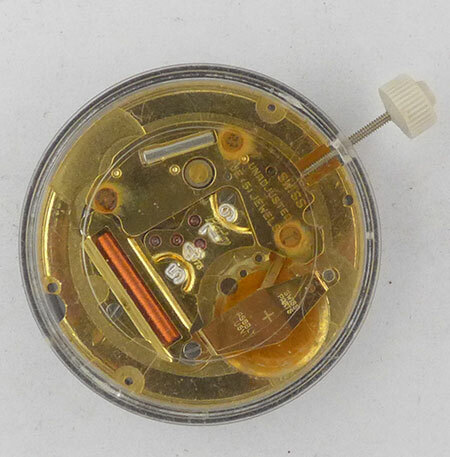 38.5mm diameter, thin movement. Dial has been refinished. Once had raised numbers (holes remain) and now painted. 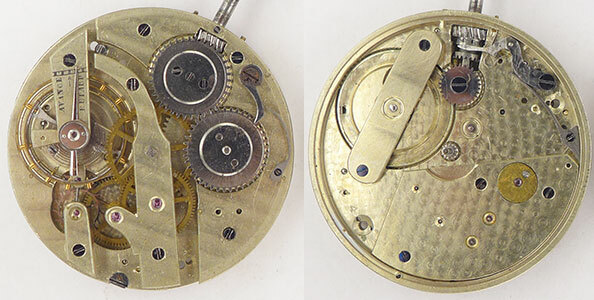 Perret & Cie pocket watch movement. 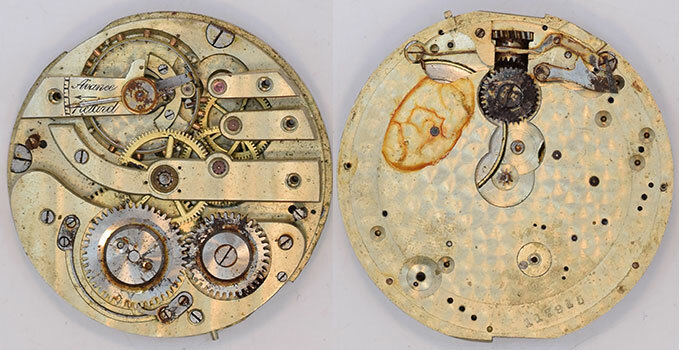 45.8mm diameter. 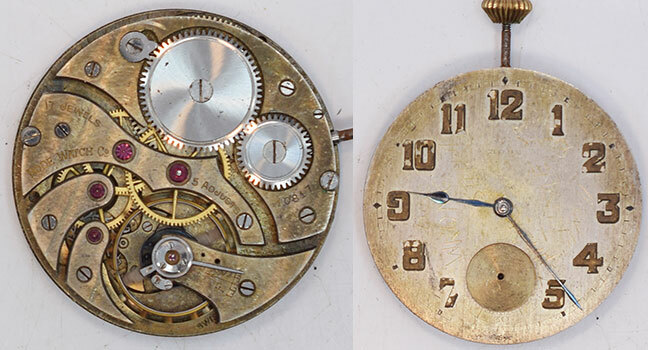 N. Robert pocket watch movement. 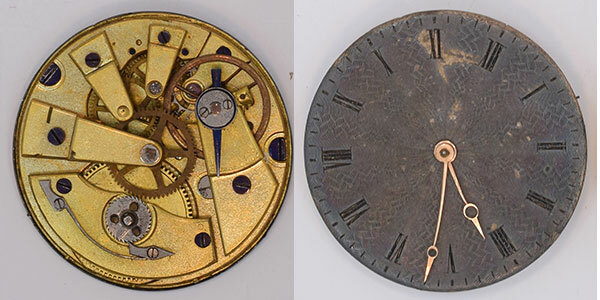 38.5mm diameter. 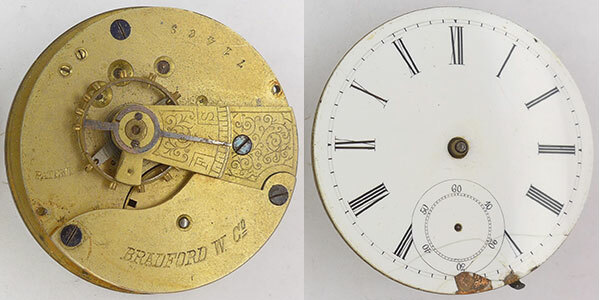 Unmarked thin movement with fancy dial. 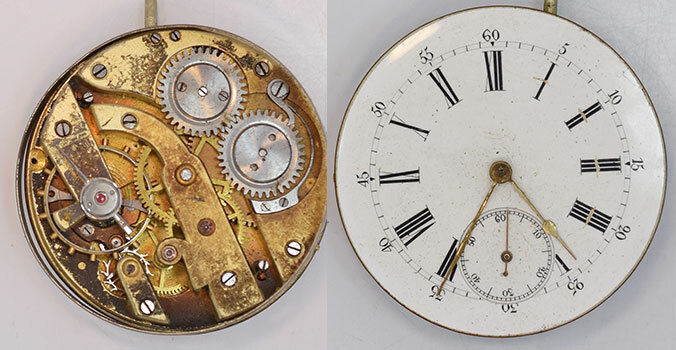 Dial diameter is 36.6mm. 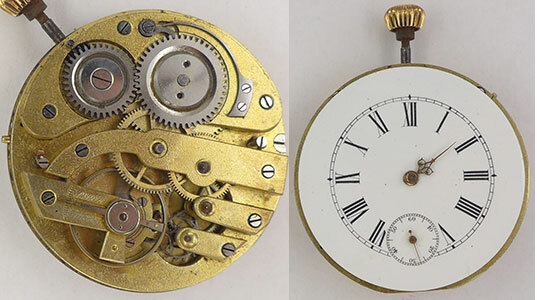 Henry Beguelin movement. 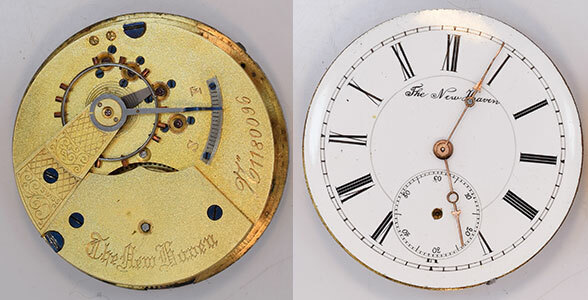 38.2mm diameter. R. Monnot movement. 36.3mm diameter. 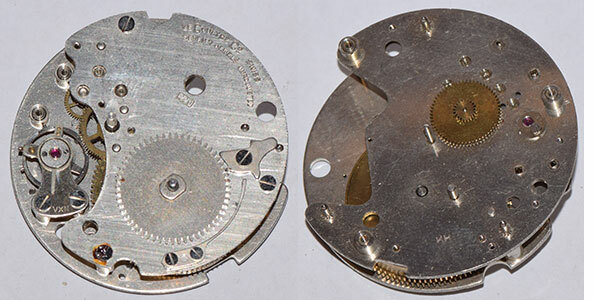 Movado 15J movement. 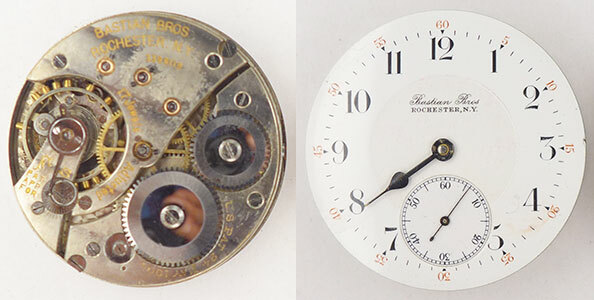 Dial diameter is 41mm. Bastian Bros. movement. 43mm diameter. 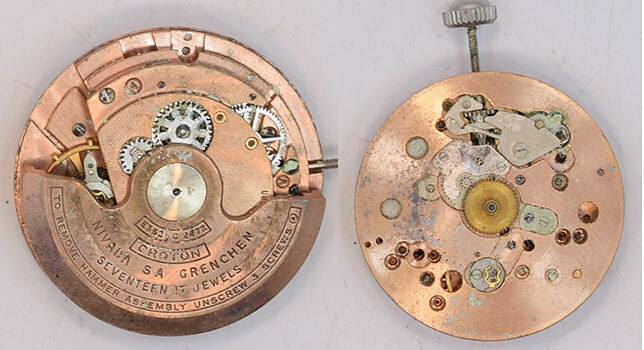 Beautiful little un-named Swiss movement. 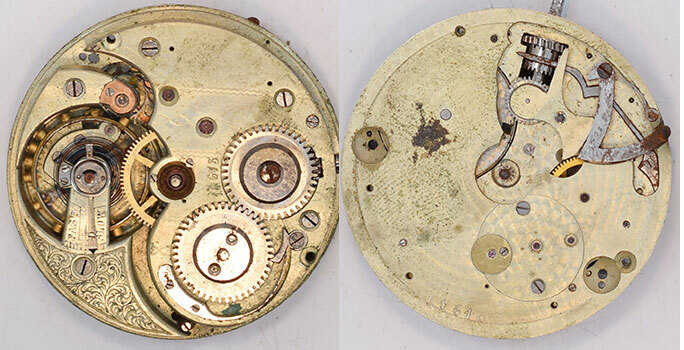 Unmarked Swiss movement. 43.1mm diameter. 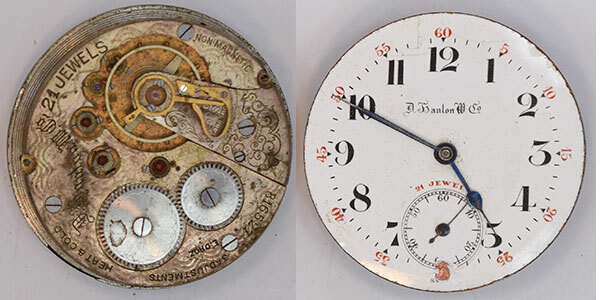 Alfred Desart movement. 36.3mm diameter. Runs with winding pressure applied. 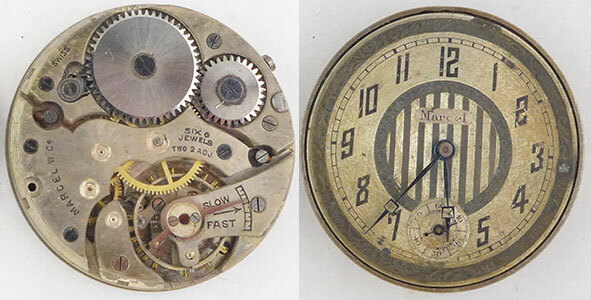 M. Marchand, Geneva movement. 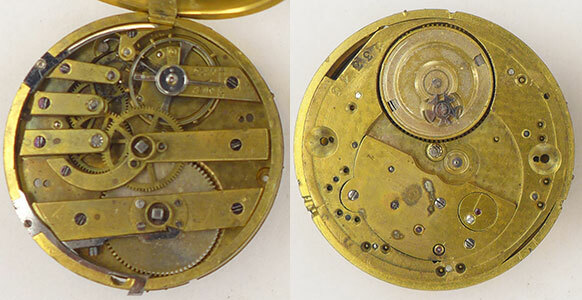 38.5mm diameter. Not running but good balance. 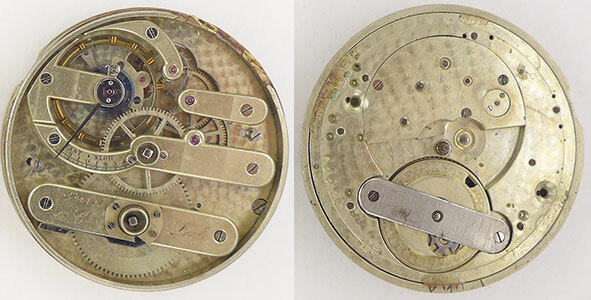 J. Perrenoud, Locle movement. 38.3mm diameter. 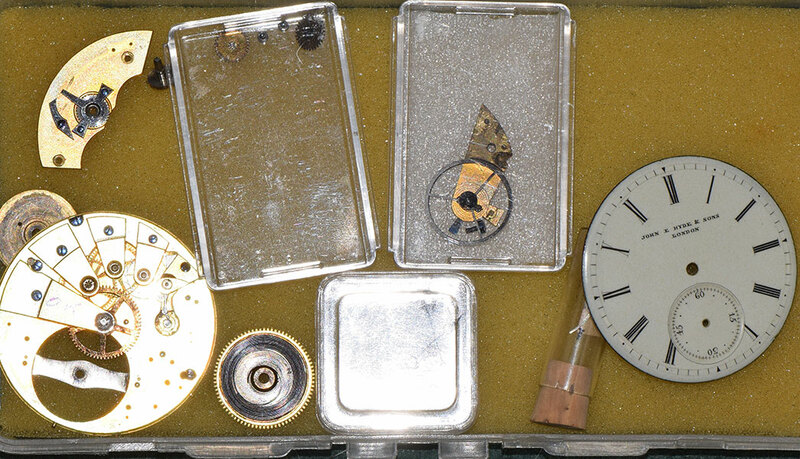 Henri Mathey, Locle movement. 44.4mm diameter. A. & U. Bourquin movement. 43.0mm diameter. 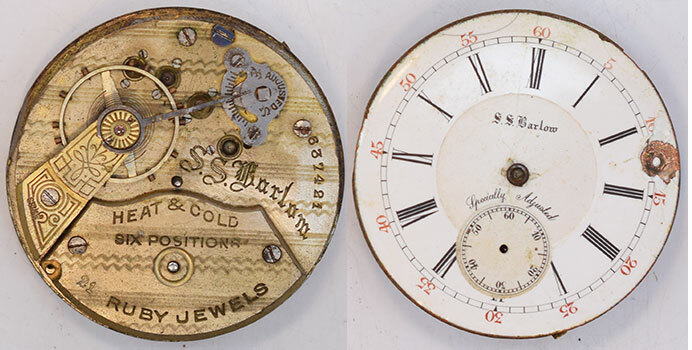 Swiss movement for Jaccard Jewelry Co. of Kansas City. 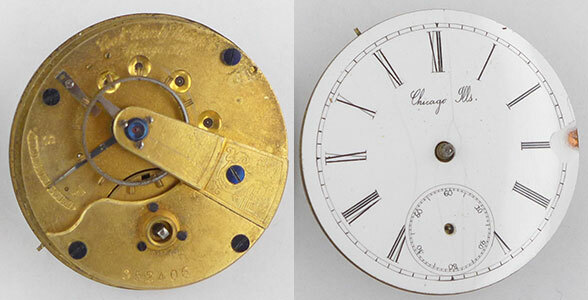 29.6mm diameter. Good balance. Stem is not all the way in, preventing winding. 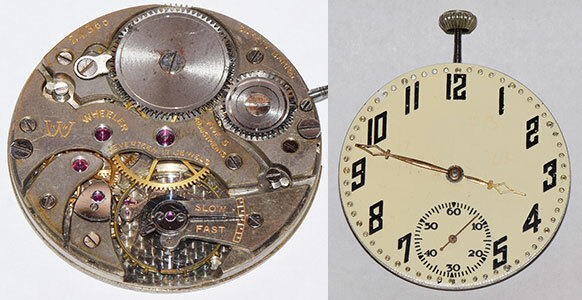 No-name movement but with crescent over 'F' logo. 40.7mm diameter. 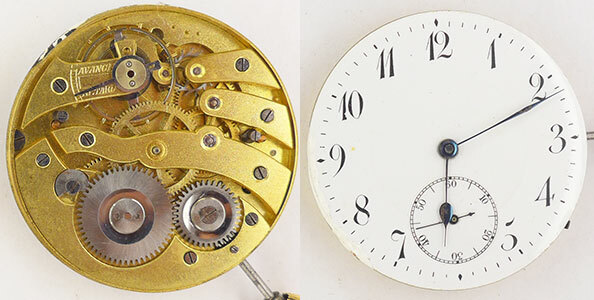 Balance seems OK but hairspring is detatched. 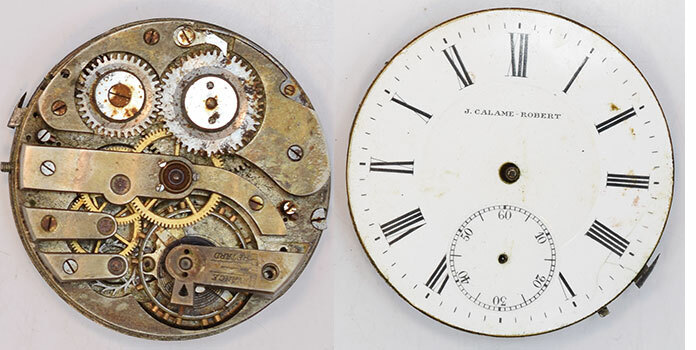 J. Calame-Robert movement. 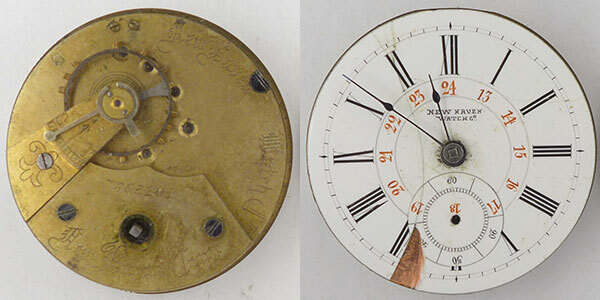 42.9mm diameter. Missing ratchet wheel. 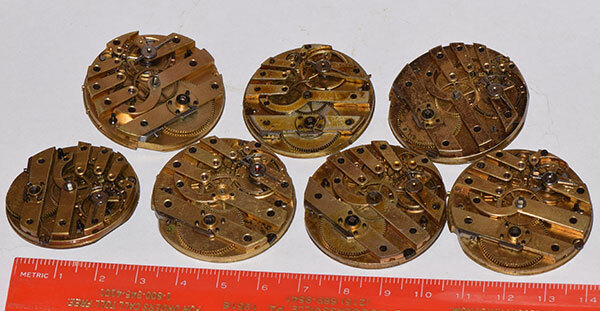 Balance seems OK.
Tacy Admiral movement. 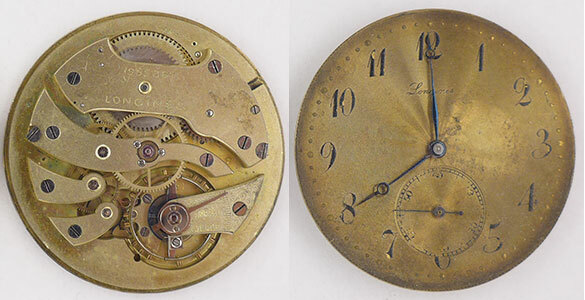 38.8mm diameter. Broken staff, oily residue on plates. 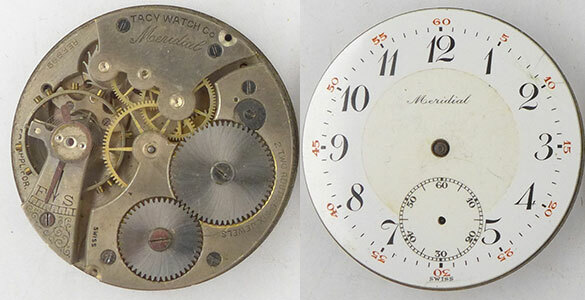 Tacy Meridial pocket watch movement. 43mm diameter. Runs with winding pressure applied. B&B Regal case. No crystal. 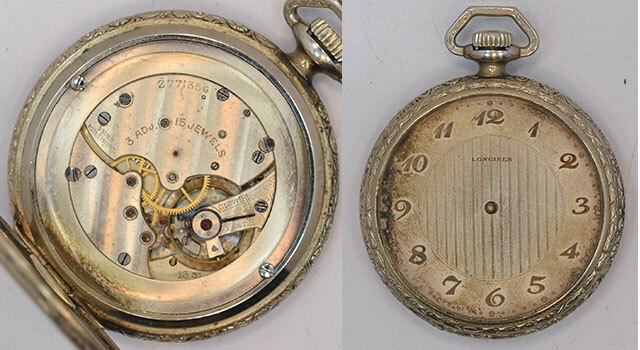 Gotham Watch Co. 17L pocket watch movement. 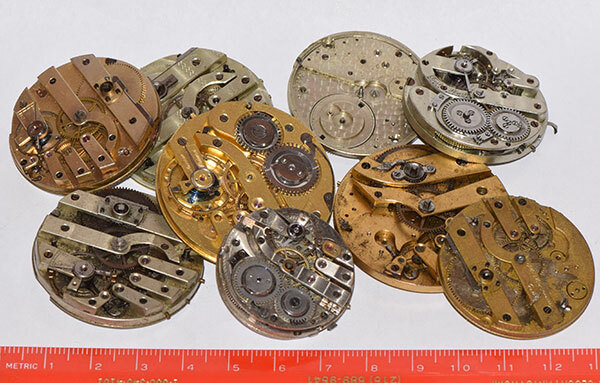 Swiss 16 jewel wrist watch movement. Not running. Balance seems OK.
Swiss private label movement for B. Bowman of Petoskey, Michigan. 29.5mm diameter. 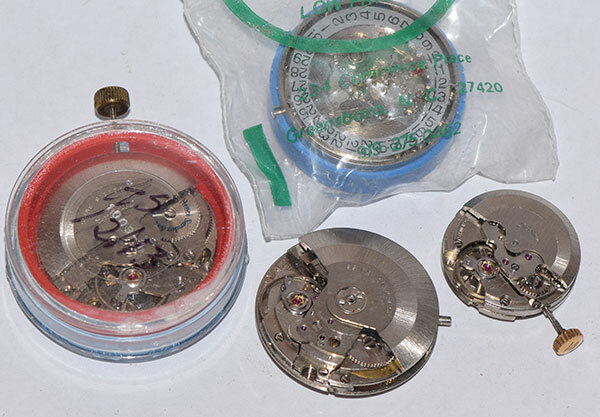 LeCoultre aircraft or car clock movement. 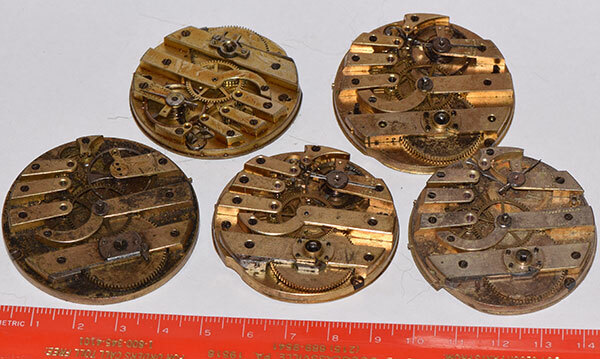 Lot of 4 new-old-stock automatic movements. Two run. Two do not but look to be in good shape. Orient Star Dynamic wrist watch. Croton Nivada Grenchen automatic movement. 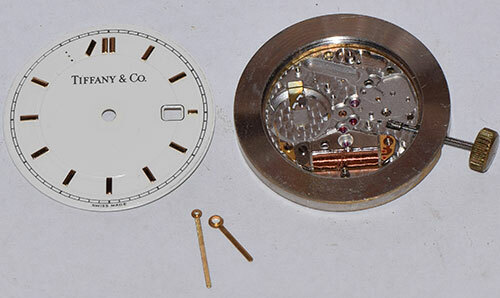 Tiffany quartz movement and dial. A couple markers at the '4' are missing. 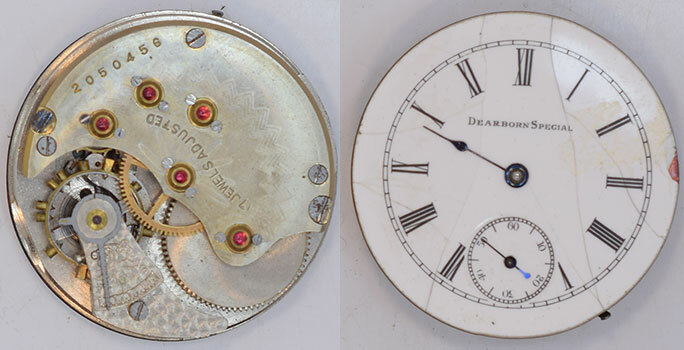 Swiss fake "Dearborn Special". Note all the fake cap jewels! Swiss fake "The New Haven". 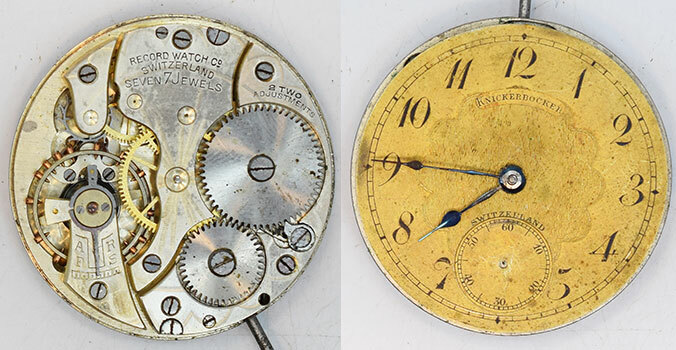 Swiss fake Cook County Watch Co.